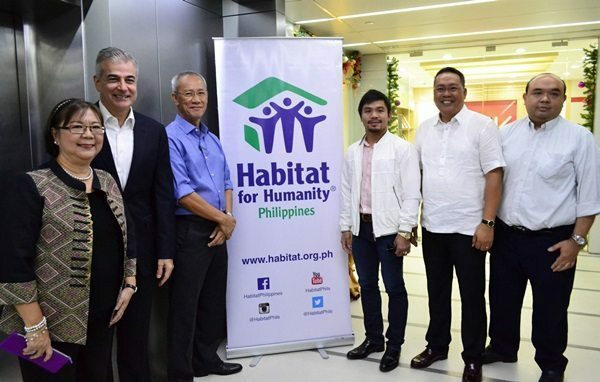 To start the new year on a positive note, Sarangani representative and ‘People’s Champ’ Manny Pacquiao renewed his commitment to be an Ambassador and spokesperson for Habitat for Humanity Philippines. 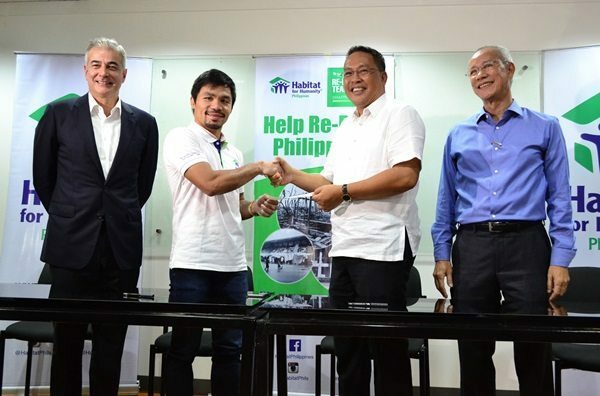 Pacquiao signed a new memorandum of agreement on January 5, 2015 indicating his commitment to support Habitat for Humanity’s “WeBuild Campaign”, which is kicking off early this year. The agreement also outlines the congressman’s P5-million donation, which will be used to partially fund 195 houses for families in Glan, Sarangani. The families — mostly composed of fisherfolk and sari-sari store vendors — will be living in “Pacman-Tata Yap Ville” in Barangay Tango in Glan, a housing project of the congressman. Each duplex unit is 32 square metres on an 80-square metre lot area. The 2.8-hectare site includes a multipurpose centre, a community park and a concrete stage that can be used for community’s special events. Pacquiao also announced plans to purchase more land for permanent houses, much to the delight of his constituents.